This section discusses general licensing requirements as well as state Part C Early Intervention policies pertaining to approval to implement TI. All providers seeking reimbursement for implementing TI require licensure and/or certification is the state in which the family/client is living. Thus, EI providers to who plan serve families across state lines must obtain a license to practice within those states. At the current time, the American Speech, Language, Hearing Association (ASHA) requires an SLP to have licensure in the state in which they work. It is possible that these rules may be reviewed as tele-intervention and tele-practice become more common. For instance, the medical profession is looking at cross-state credentialing and privileging to potentially lessen the burden to the provider who must pay fees to work in multiple states. It is possible, in the future, that agencies delivering medical services may accept credentialing by proxy for professionals delivering services through tele-health. Perhaps this will set a new standard for licensure as well. Limited licensure is yet another consideration. This would allow states to monitor tele-practitioners who are providing services in multiple states without unduly restricting their practice. It will be important to follow these trends in the medical field and the guidelines published by ASHA. While ASHA has documented relevant issues for SLPs, there is currently no comparable document for Teachers of the DHH. It is the opinion of the learning community that TI warrants attention by other fields as well. The Health Resources and Services Administration (HRSA) published a report to Congress [PDF] in regard to licensure portability, summarizing the experience of HRSA-funded Licensure Portability Grant Program grantees. Although it focuses on physicians and nurses, the issues and challenges have relevance to the provision of TI as well. 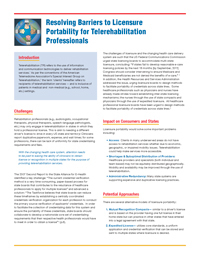 Some strategies for resolving barriers to licensure are provided here from a sub-committee of the American Telemedicine Association's (ATA) Telerehabilitation Special Interest Group. 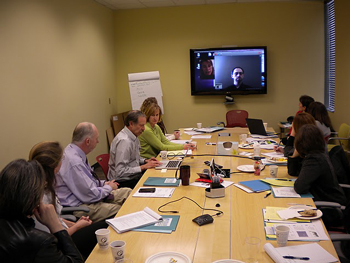 ATA and other advocates of telemedicine have promoted forms of reciprocity among states. They encourage health care professionals, consumers and other stakeholders to show their support for the creation of streamlined regulations to facilitate telemedicine and telehealth efforts. An early publication entitled Overview of States' Use of Telehealth for the Delivery of Early Intervention (IDEA Part C) Services (2012) investigated the prevalence of TI within state Part C programs. The sources of reimbursement, particularly Medicaid, greatly impact implementation.